In October 2015 we lost our deputy editor, Jenn Hill to cancer. Since then she has continued to inspire friends and riders from all over the country to ride bikes and just get out and have adventures. It was around the time of her death that we fostered a relationship with the St. Gemma’s hospice in Leeds where Jenn spent her final weeks. In December of that same year, with your help we raised over £8000 for the St. Gemma’s trust – hospice care provision is mostly funded by charitable donations. 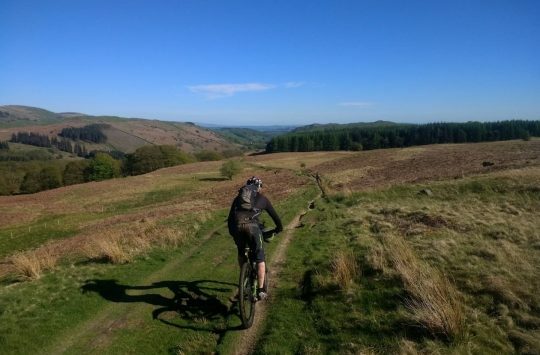 The care that St. Gemma’s provided for not just Jenn but to her husband and Singletrack/Gritcx contributor and editor Tom Hill, was truly remarkable and inspiring. It is a level of care and compassion that they give to countless patients and families every day and it’s why, following Jenn’s death we have looked for more ways to help support this amazing charity. And this is where we will introduce you to our next plan. 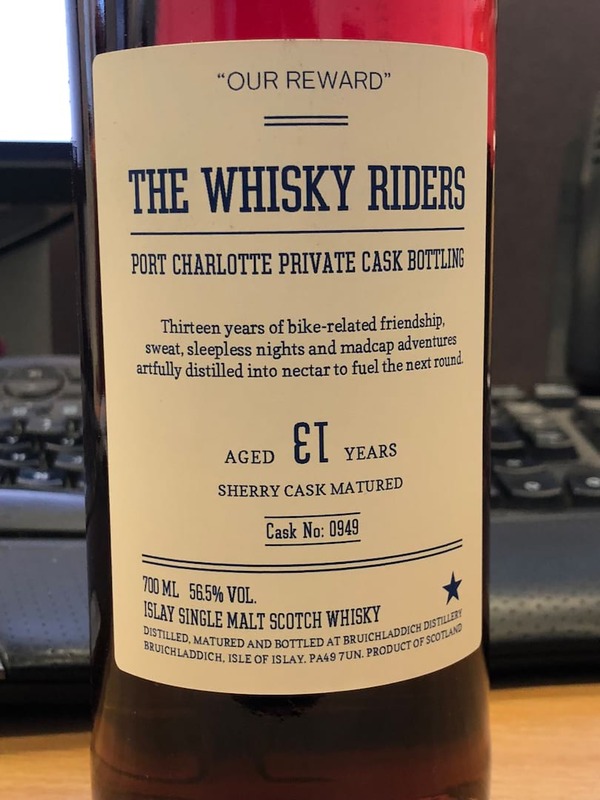 Around 14 years ago, a bunch of mountain biking friends and aquaintances from accross the bike industry and beyond, met remotely via email and decided to take up a rare opportunity of commisiioning a private Port Charlotte cask of whisky at the Bruichladdich distillery on Islay. There were 12 so called ‘investors’ and two of them were our very own Chipps and Mark. They all patiently waited while their young whisky matured in it’s barrel for ten years. No single malt whisky should be touched unless it’s at least 10 years old – at least in the opinion of the Whisky Riders. 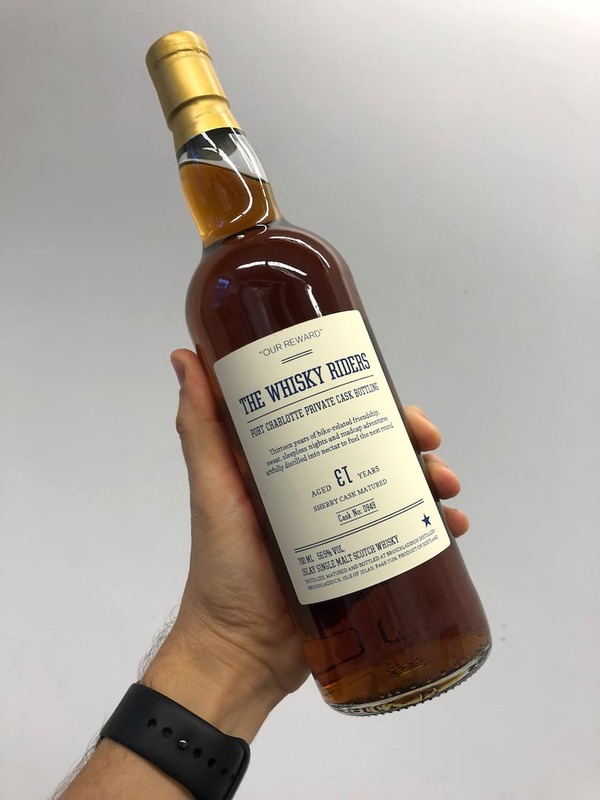 At the ten year anniversary they all met (virtually – it was the 21st century afterall) and the decision was taken to keep it in it’s cask and delay bottling for another year. As each year passed the question was asked again, ‘Do we bottle it now?’. You see, the thing with deciding when to bottle a barrel of whisky is that it comes down to two factors – patience and the fact that with each passing year more of the liquor is lost to evaporation – The Angels’ Share, as it is known. Plus there’s the fact that usually, the taste of the whisky matures with age. This is mostly why aged whisky is so valuable. There’s also the cost of storage of the barrel since after 10 years most distilleries start charging rent for private casks. So, they held out for three years beyond the 10 and decide to bottle at 13 years. Well, it was a silly number and they figured that would make it even better. 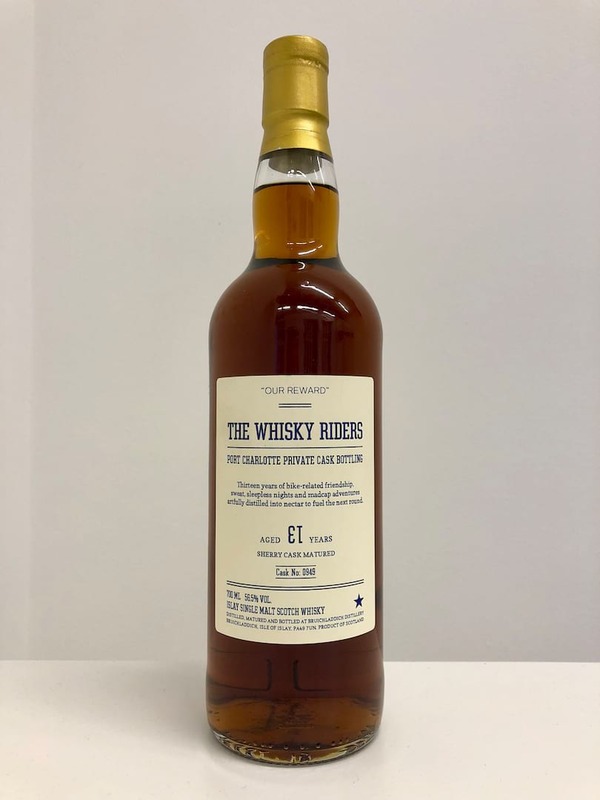 They all met in a Scottish whisky restaurant one evening in 2017 to try a sample from the barrel before it was bottled and it was shockingly good. Bruichladdich (‘Laddie’) distillery is perhaps not best known for deep coloured, peaty whisky but that’s what they got. 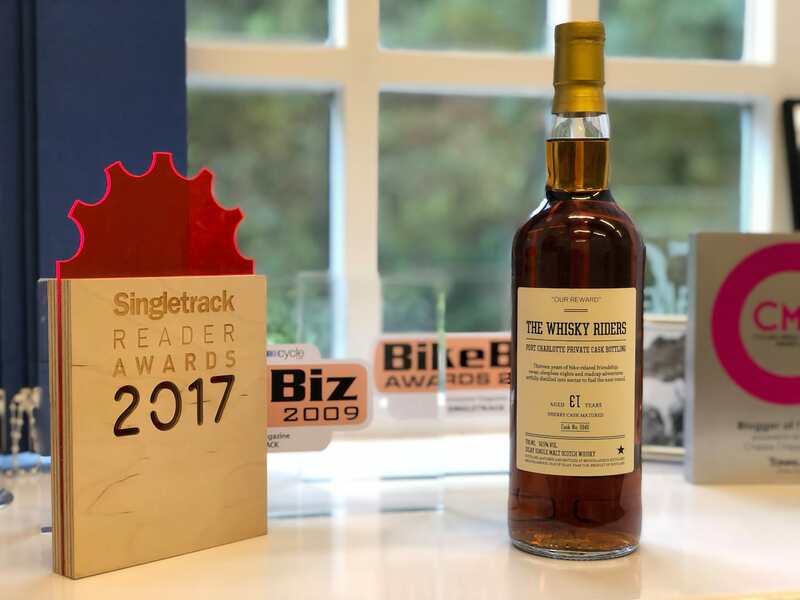 Suffice to say that for some of the Whisky Riders this was the best whisky they had ever tasted – they may, of course, be biased in this. They have been waiting for 13 years to try it, but everyone who has been privileged enough to try a dram seem to agree that it is something very special. If you love cask strength (56%), peaty whisky then this is likely to hit the spot for you. It’s also extremely rare. At bottling each member recieved their share of 26 bottles each. That was a year ago. There are less around a year later. Apparently Mark has gone through five bottles already. In a few years they may all be gone. But there was a numerical anomaly at bottling that left three remaining bottles unclaimed by the 12. And with the agreement of all, these three bottles are here and we are going to auction them off to you guys with all proceeds going to St. Gemma’s Hospice. So, one bottle will be auctioned here, in the comments of this article. 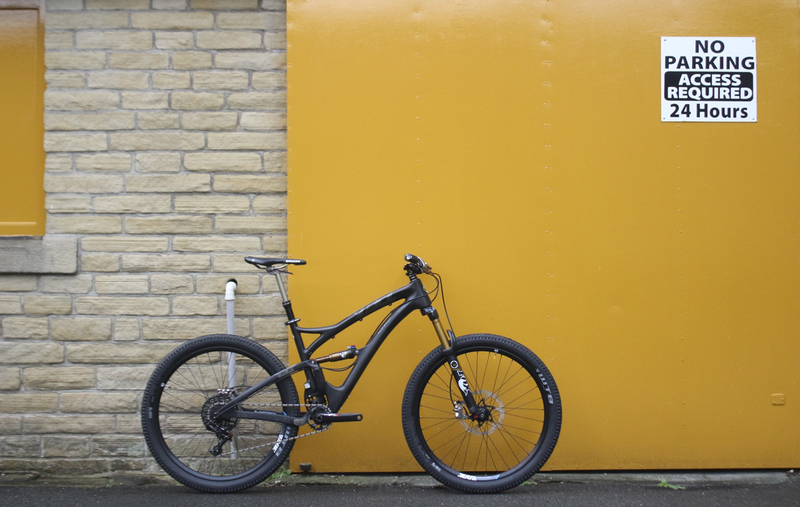 Another will be auctioned on the evening of our Reader Awards event in Hebden Bridge on Thursday 18th October. The third bottle will be offered to auction to our Life Subscribers. The auction here on this story opens from now and closes at 12 noon on the 18th October. At exactly 12 noon on Thursday we will close the comments to this story and all bids will cease. The highest bidder wins. The rules to the online auction. Before you post your first bid you must contact us at the office on editorial@singletrackworld.com to register with us for the auction. You need to provide us with your full name, username, address details and a contact phone number. We will delete bids from anyone who does not register with us first. The comments section will be reserved for bids only. If you want to discuss the auction then feel free to head to the forum. If you win the auction you will be invited to make a charitable donation directly to St. Gemma’s via their website for the winning bid amount. Once we have confirmation of the donation from St. Gemma’s we will arrange for your bottle to be delivered to you. We will deliver the bottle to a single UK address only. 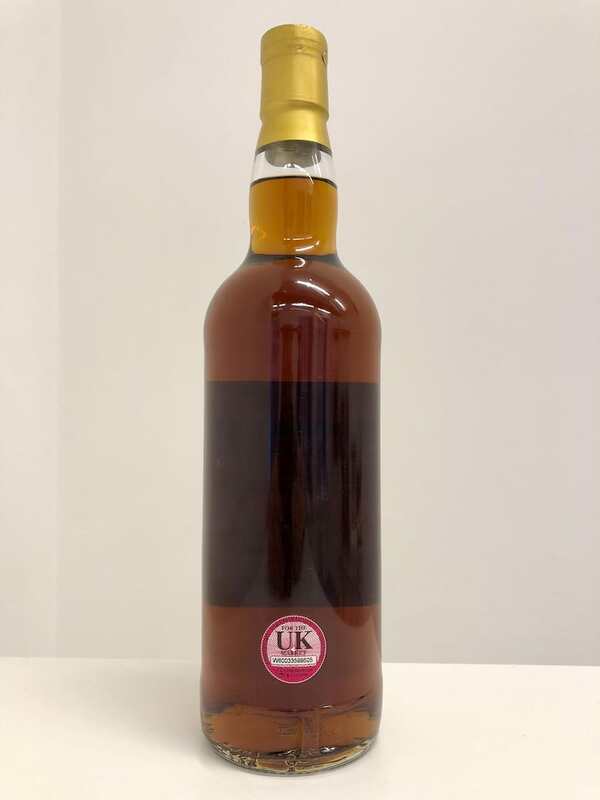 If you want to bid from outside the UK that is fine but you will need to arrange collection of the bottle from our office in Todmorden if you win. Chat about this auction on the forum here. And with that, let the auction begin. If you just want to donate to St. Gemma’s you can do so here. 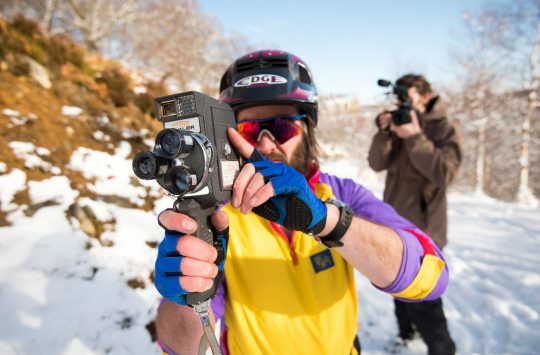 Final Update: Yeti SB5c Auction Finishes 31st October! Can we have a gentleman’s agreement that increments are of more than a quid? In keeping with the gentleman’s agreement…..£527!